Hi ladies, today's makeup look is so simple and easy. I believe this is one of the easiest makeup look I've done since I started this blog yet it is still bright and fresh very spring appropriate. All you really need is a bright colored eyeliner of your choice (mine is pink) and a pink blush. Lioele BB Cream - Since I'm going for a more natural look, I'm using a BB cream. For those who wants a more full coverage, feel free to use a foundation. I'm not using a concealer either, just adding a second layer under my eyes to hide those nasty dark circles. NYC Sunny Bronzer - Lightly contour. You can actually skip this step but I just needed a little bit of defining so I added this step. NYX Powder Blush in Rose Garden - Apply this blush right on the apples of the cheeks for a nice flush as well to Really bring out those cheeks. MAC lipstick in Sunny Seoul - Use any pink lipstick of your choice. Maybelline Eyestudio Quad in Sunset Seduction - Use the lightest shadow to highlight the inner corner of the eyes as well as the inner part of the lower lash line. This opens and brightens the eyes and also gives emphasis on the aegyo sal. Also take the darkest brown shadow and apply it on the outer corner of the bottom lash line just to balance the eyes. Apply peach shade shadow lightly all over the lids for a wash of color. Tony Moly Perfect Eyes Waterproof Liner - Using a pink liquid liner, (you may use other colored liner if you want), apply a thick line of this colored liquid liner on your upper lash line. Graymelin Control Sharp Liner Waterproof in Black - Apply a thinner line as close to the upper lash line. 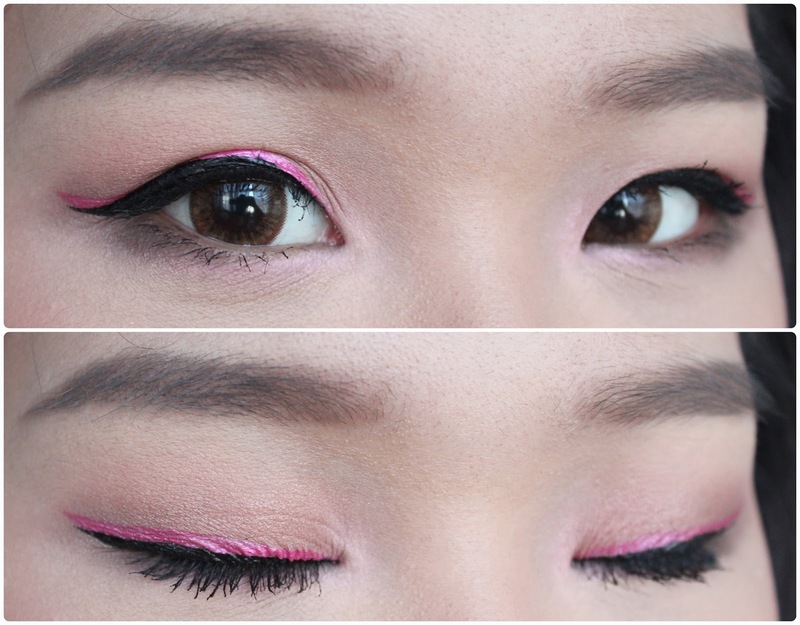 Make sure that the colored liner peeks through. Milani Liquif'Eye Metallic Eye a liner apencil - Tightline. Maybelline Colossal Cat Eyes Waterproof Mascara - Curl lashes and apply lashes on the upper and lower lashes. Ooh wow this is so pretty! Great way to subtly add color to your eye makeup! Love it! love the tutorial. I've never tried bright eye makeup like this. Looks great on you! Love it! I super love the color combos that you have used for they are soft, classy and girly. Great choice indeed!